Mexican Corn on the cob recipe is oven-roasted and topped with Cotija Cheese and cayenne pepper. It is a mix of smokey and tangy flavors. I don’t have access to a grill, so, I cheated (a little). A cast iron and the oven will work (almost) like a grill. If you are not the type of person who likes Mexican food, you may need to go into hibernation until Tuesday! It is Cinco de Mayo time and that means one thing! Everywhere you and I look this weekend, there will be all kinds of Mexican food recipes. There will be classics, twist on classics and very creative recipes that will leave both our jaws on the floor. Mexican food is my first favorite food after Indian food! Both of these culinary cultures are known to be very accommodating to vegetarians. I love how Mexican and Indian cuisines have an extensive cornucopia of choices to vegetarians. You should see me when I am at a buffet for either of these cultures. A Kid in a candy store doesn’t come close to my excitement level. Corn on the cob is a favorite in every culture that I have come across. Take the American Deep South, for example. They eat it for Sunday dinner and during summer picnics. It is always the designated side dish in Soul Food and barbecues. I am drooling just writing about it. In Eastern Africa, vendors have an outside grill with charcoal. 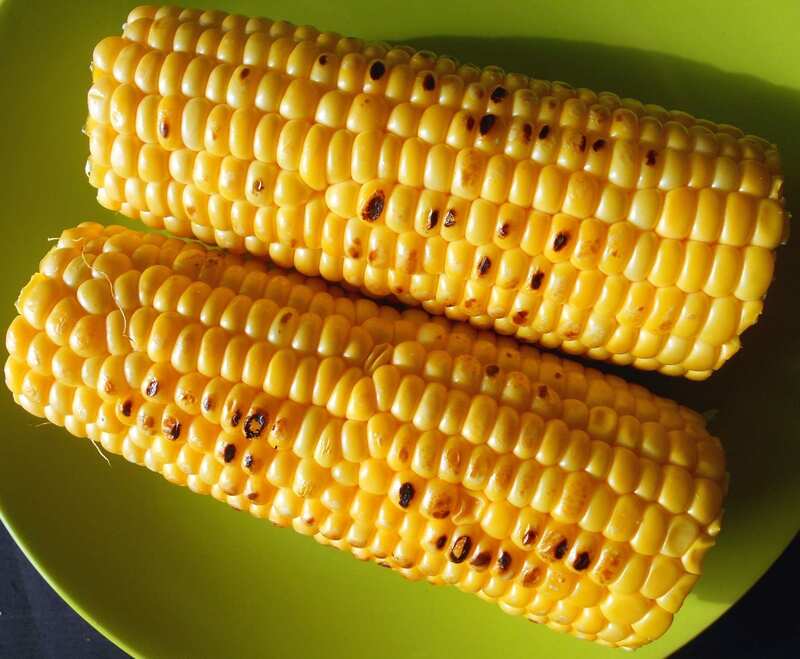 They will grill the corn, lace it with Lime juice then sprinkle it with salt and cayenne pepper. It is then sold to eager bystanders for a few pennies. Recently, I have seen the Japanese version of corn on the cob. It is grilled and boiled, then grilled again. It is laced with mirin and served immediately. There is a recipe that I would love to try soon. The Mexicans really know how to do corn on the cob. So often they will use mayo, sour cream, Mexican Parmesan cheese, Cayenne pepper, Lime, Coriander, peppercorns and the list goes on and on. It is safe to assume that I have never had Mexican Corn on the Cob the same way more than once. 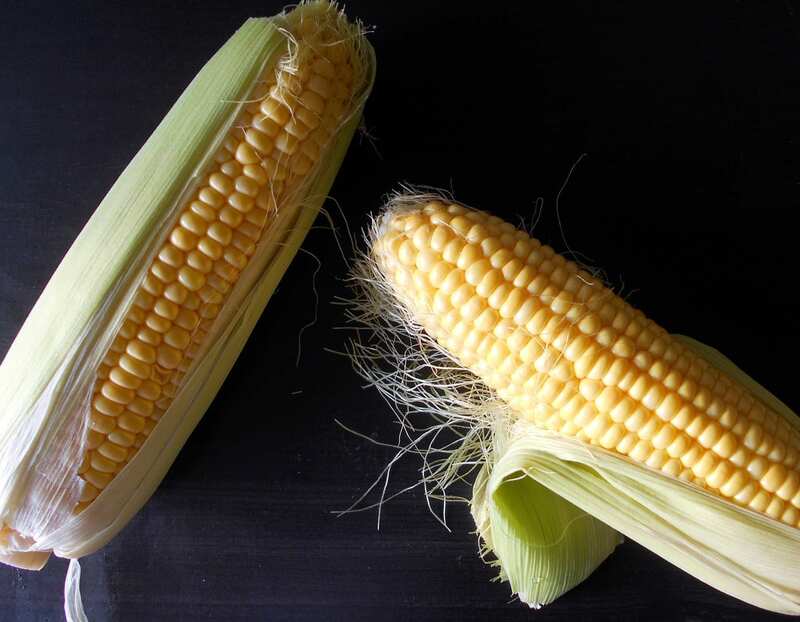 Foodies love seeing and eating many varieties of Mexican Corn on the Cob. That is because we get bored easily. I feel like I should apologize for our short attention span….? In my version of Mexican Corn on the cob, I use sour cream and Mexican Parmesan cheese. Personally, I am not a fan of Mayo because it contains eggs. Vegetarian Mayo still has a long way to go before it can be called Mayo. 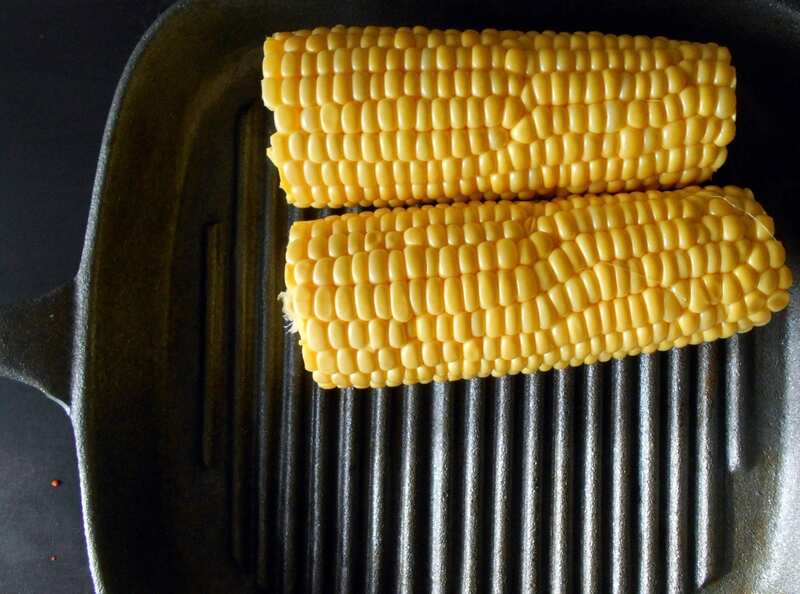 Just butter the corn on the cob and place in a heated cast iron pan. Place the cast iron into the oven and let the magic happen! If you like this Mexican corn on the cob recipe, how about trying my Mexican street corn in a taco bowl recipe? 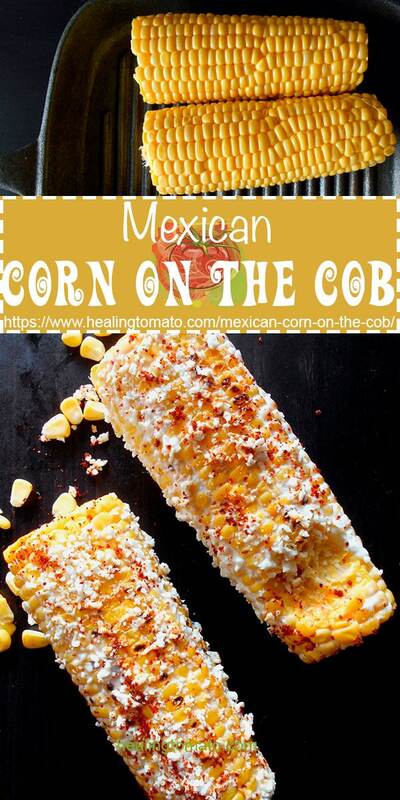 What is your favorite way to make Mexican Corn on the Cob? 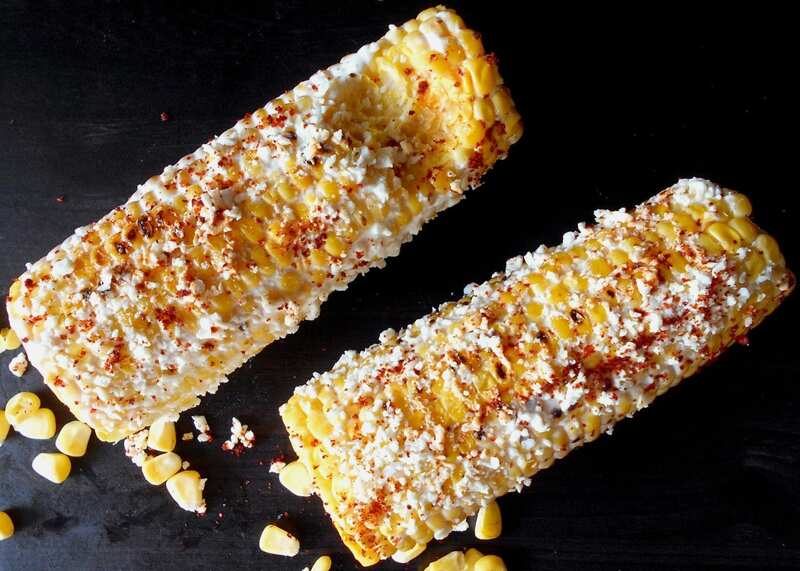 Mexican Corn on the cob recipe is oven-roasted and topped with Cotija Cheese and cayenne pepper. While the corn is in the oven, mix the sour cream, salt and black pepper. Haven’t made it yet, gotta get some fresh corn from the Amish first…..but still will give it a 5*…. Sure sounds good and looks good too….. Thank you so much, KentuckyLady. I appreciate the 5 stars. Its my understanding that Cotija’s is usually known as Mexican Parmesan. So, you can find it in stores or here is my affiliate link to Amazon – http://amzn.to/2hlaCLK 🙂 Please let me know how you like it. Thank you, Juanita. That is an even better idea. Thank you, Kris. I am sure you will like it. Absolutely delicious! Cannot wait to try this! I have never made this type of corn. Will definitely try it very soon! Thanks for the post and the inspiration! Thank you, Laurie! I am so happy that you stopped by. You will not be disappointed by this recipe. This looks incredible! I would love to fix this with the ribs and beans I am having this weekend!